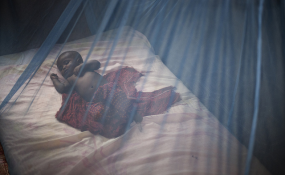 Luanda — MORE than 1 200 people have died of malaria since the outbreak of the mosquito-borne disease in Angola this year. Most of the victims are children under five years of age, mostly in the central Huambo Province. Clementino Sacanombo, Huambo malaria programme supervisor, said the province was experiencing its worst malaria outbreak in months with over 175 000 cases reported this year (2017). Comparatively, there were about 13 000 cases this year. "The (Huambo) province has been in an emergency due to the malaria outbreak peaking since May," Sacanombo said. "The numbers of patients and deaths are increasing abruptly, demanding from the authorities a prompt response." Sacanombo said the government of President João Manuel Gonçalves Lourenço, in power since September, had intensified extra-household fumigation and malaria prevention awareness coupled with the distribution of long-lasting insecticide-treated mosquito nets. Apart from malaria, Southern Africa's biggest country by area has this battled the spread of cholera and yellow fever. The outbreaks are attributed to severe flooding that lashed the country of 29 million people earlier this year.